Forklift Batteries for Sale: Tips You Must KNow When Buying - Be Certified Today! An electric forklift battery can last up to five years and it could last even longer when it is properly taken care of and given good service. But sometimes, unfortunately, it dies earlier than expected. When that happens, it would be wise to replace them immediately so that workload would not be affected. Typically, the most common sign that battery needs replacement is that it degrades to just few hours of operational use. You may hear such report and complain from the operator. This is also a safety issue because the operator may have hard time driving the equipment, then, the forklift just simply bogs down. Now that your forklift has bogged down and it is causing work downtime it may be the right time to buy battery to get the forklift back to life. Luckily, finding forklift batteries for sale is convenient because you can find hundreds of suppliers by searching them on the internet. Prior to calling these suppliers to make an inquiry, it would be helpful for you to know this information that we prepared before making the final decision of buying. Check the size and dimension of the compartment where the battery is to be placed on your forklift, usually the unit of measurement is in inches. When you make an inquiry, the first thing the supplier will ask from you is the dimension of the compartment. Remember not to give the dimension of the old battery. In determining the voltage, count the number of cell your battery has. If your battery has 24 cells, then it requires 48 volts. Each cell is a nominal 2-V in a typical lead-acid battery. To accurately determine the required voltage, consult the owner’s manual or your engineer (if you have one). Any mistake could cause severe damage to your forklift, if you’re unsure, it would be better to consult a professional, an engineer or the forklift manufacturer for this purpose. AH rating simply mean the amperage discharge in relation to the length of time use. The lower the discharged amperage during use, the more efficient the battery becomes. 600 Ampere-Hour rate @ 6hrs: 600AH divided by 6hours = 100 amperes of current for 6 hours run time. 945 Ampere-Hour @ 20 hours: 945AH divided by 20hours = 47.25 amperes that can be supplied for 20 hours of operation. You can check the AH rating from what you have in your old battery or you can ask the supplier for the best recommendation for your forklift. Every forklift model has manufacturer’s recommended battery weight requirement. Installing battery which is lighter that what’s recommended by the manufacturer is a safety concern that should be taken into importance when choosing the right battery. 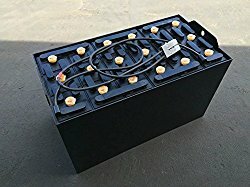 Weight should be given due diligence when buying battery. The weight requirement can be seen on the forklift data plate or can be found in forklift owner’s manual. Check the specifications of the battery that you are currently using in your warehouse if it is specifically matched with the battery that you are buying. You can send those specifications (together with the model and brand of the forklift) to the supplier so that they can recommend to you what they have on stock. They are expert in their field, if you are uncertain what battery you should be buying, by just telling them the charger specification and model and brand of the forklift, they can give you expert advice of what you should be buying. It is better to buy battery which has too much cable length than to have too short. Take note also the position of the connector. Check also the type of the plug and its color of your old battery. Remember that connector will only fit other connector with same type and color. Verifying first the plug colors you have in the forklift will get you out of trouble. Of course, it is self-explanatory, the longer the warranty the supplier can give, the better. Other considerations you can inquire aside from the warranty are the labor and parts. If they can send a man to do the replacing on-site in the event the battery bogs down and if the parts are free of charge and readily available so that it won’t effect the time for the battery to be repaired. Reconditioned forklift battery has a price advantage compare to brand new one. Used battery is usually half the price or fraction of the price of brand new. Reconditioned ones are completely tested by the supplier before it is sent to prospective buyer. It is also thoroughly inspected to assure product quality. Reconditioned battery can last long when proper maintenance is done to it. You can refer below about proper maintenance. Check the forklift battery that you’ve ordered for any mark of delivery service damage or mishandling. Go through its packaging, see if there are rips, punctures or any sign of neglect. The packaging should bear the mark “Fragile” or “This Side Up” or “Do Not Stack”. If you’ve seen a sign of fluid spillage, top covering damage or any tell-tale sign that could indicate mishandling by the shipper, indicate it on the bill of lading before signing. Communicate with the manufacturer/supplier about the issue. When the battery arrived from supplier, it is placed in a small pallet the size of its dimension. It is also secured by steel band and stretch wrap to prevent from moving during shipment. Inspect pallet for damage, if you notice large punctures, it is an indication that it could have been dropped. With the sheer weight of the battery, it will obviously create injury on the pallet if it is dropped during shipping. If the securing band and wrap are loose, the battery could be banged up by the delivery service. Remember that when the battery is released by the manufacturer/supplier, they ensure its superior packaging before it is delivered to you. Also inspect that cable and wire the battery comes with. It should be free from cuts and pinches. If you detect presence of it, the delivery service could have stacked other heavy materials on top of the battery during transit. Suspicion of stacking could be confirmed if you saw top covering rip and tear. Contact manufacturer about it. The battery should have sufficient quantity of fluid in it to perform in the best condition. The inspection is usually done at least once every two weeks. Go through each cell to verify if there’s enough fluid. Add water if necessary to increase the level, the fluid level of each cell should cover the plastic element. Before adding water, make sure that the battery is fully charged to prevent overflowing and splattering of acid on the floor. Keeping it watered to recommended level averts the elements inside from running dry. By the way, inspection should be done in designated place or in well-ventilated battery charging area. Check the Material Safety Data Sheet (NSDS) about it. If the forklift battery that you will be buying is too light for your forklift, then there is a chance that it can affect the center of gravity during operation. It is of course is a very serious safety issue. The forklift could tip over on ramp or when driven on slope floor surfaces. Consult the owner’s manual to check the correct the correct weight of the battery required. When you bought a brand new battery and installed it in your machine, it has a 1,500 cycles before it deplete its performance. Each charging time is called a cycle. If you charge your electric forklift once every day, the battery could last approximately 5 years. When the forklift is used heavily in the workplace, charging is usually done several times each day. If you have a fleet of electric forklift in your workplace, it is suggested to have a charging schedule. You would not want all your machines to run out of power in a given time. So make a schedule. Keeping a record to track when it was bought and the cycles it received is a good practice to monitor its performance. Keeping a record also helps you for claiming warranty if manufacturer ask for it. Forklift operator must monitor the battery capacity of the electric forklift he’s using. It’s very common for operator to forget it due to obvious reason of being busy doing his job. Because of that, the battery is discharged beyond 80% its capacity causing the battery to run in high temperature that could cause severe damage to the components. The normal battery charging period is 8 hours, you must give it sufficient time to receive complete charge. You could also cause damage when you charge a semi discharged battery, it is recommended to never charge it until it has reach its state of charge (SOC). Consult your owner’s manual for this.